Now that autumn is here and winter is also come. Yes, we all know what that means… Bye bye, sun and hello short and cold days… I’m not a fan from this period because you get ill and you will need an energy boost often. Or in my case I can use an energy boost every day, yes I seriously hate this cold period… So I started a few week ago with drinking different ginger blasts. This sounds a bit weird, but I will explain everything… A ginger blast is a mix from Filipino, Hawaiian and Indians best ginger extracts. This blend will help you to give you more energy and to get your physical and mental prestations better. But this isn’t everything… Because ginger blasts also helps the body to detoxify, so this is also the perfect detox! Curious what I find from these blasts? I tried out the 4 flavors and each day I drunk 1 or even 2 glasses hot water with the ginger blast in it. I will give you some more information… Ginger blast is one of the newest products from Lombardia. These ginger blends are made from the purest form of ginger and eventual with other good ingredients. So this powder is from sustainable grown ginger, it gets plucked when the plant contains a lot of gingerol and zingibain. So thanks to that is this one of the strongest ginger blends that exists. It helps against exhaustion and gives you an energy boots. So perfect to drink a cup of this each day. If you don’t love the strong taste from ginger, then there are also other blends where the ginger is not that strong. You go 4 different blends. This one consist of the full 100% ginger extract. It’s a powerful powder, and ginger lovers will love this! This must give you extra energy, more resistance and it helps to relieve the stress. It is a very strong ginger power. I love ginger, so this is personally my favorite. This is a combination from matcha, ginger and lemon. This blend must give you more energy and with that energy you must survive the day. This blend is the perfect combination for when you have stress, tensions or exhaustion. It is a more subtle taste so the ginger don’t taste that strong. Exists out of ginger and lemon. This helps against dips, irritability and mood swings. So this is the perfect drink during that monthly period. 😉 This is a good combination from ginger and lemon that is not to strong. The last one is a combination from thyme, ginger and sage. If you are getting a flu or sore throat, then must this give you the boost that you need. So if you wanna boost your health is this the perfect drink! Also when you are starting to feel ill, I can helps to get you better soon. Personally I don’t love this as a drink, I think it’s more something to add flavor to your dishes. But, when I’m starting to get ill I will drink this… But luckily it works! I’m a huge fan from these ginger blasts! They each have their own lovely taste. I’m a real ginger lover so for sure the 100% ginger powder is my favorite. All the 4 powder have another working, and they really work! So they helped me to not get sick, when my boyfriend was really sick. For the rest I think that these gave me more energy for sure. I drink these powder daily in the morning and they really give me the boost I need! I can’t start my day without my ginger drink! 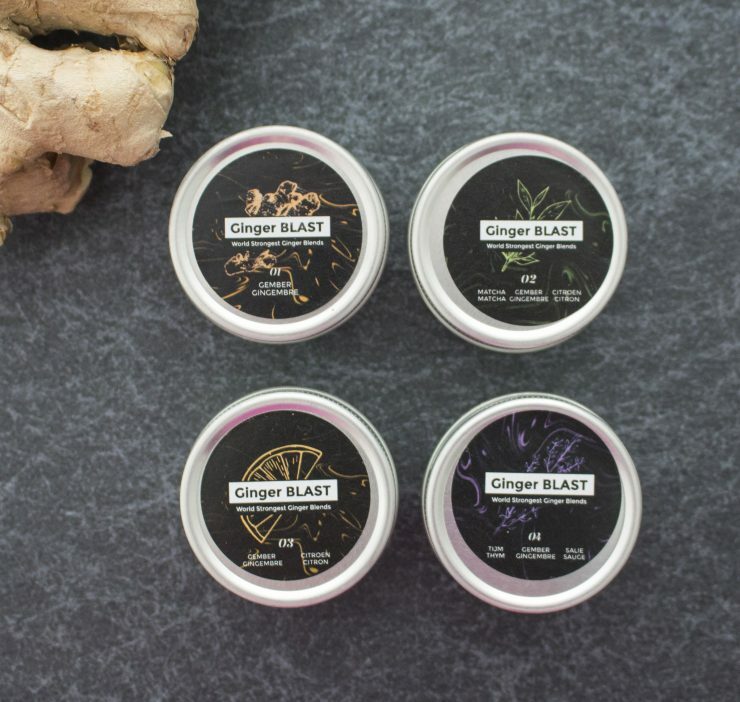 Price: ginger blast cost €17 for 45ml. For a set with 4 flavors it’s €57.